(VIDEOS) HM Queen Rania of Jordan Presides Over the 2016 Queen Rania Awards for Excellence in Education. On Tuesday, December 13, 2016, Her Majesty Queen Rania of Jordan presided over the 2016 Queen Rania Awards for Excellence in Education in Amman, Jordan. “In the award ceremony, held at Al Hussein Youth City’s Palace of Culture, Her Majesty awarded prizes and certificates to winners of the 11th Teacher Award, and the 2nd cycle of the School Counselor Award. Queen Rania underlined that progress in education involves training teachers before and during their employment, and called on teachers to lead what she described as an ‘educational renaissance’ from within their classrooms, and to invite their communities to be a part of this renaissance. The Queen delivered her speech less than two months after she launched the Queen Rania Teacher’s Academy’s pre-service professional training program. ‘They have proved that there is still room in those packed classrooms for innovative solutions and creative ideas,’ she added. Queen Rania stressed that despite the pressing need for an upgrade in Jordan’s educational system, ‘we maintain our principles and identity, while advancing the sciences and our knowledge.’ In this scope, the Queen explained that textbooks should become a partner and a reference for teachers rather than a hindrance limited by rigid style and wording. Her Majesty said she is baffled by those who do not wish to advance and develop Jordan’s education, adding that her appreciation grows “for each exceptional teacher and for anyone who stands by teachers and support them. As QRAEE’s Chairperson of the Board of Trustees, Queen Rania awarded 23 teachers and 5 counselors at the ceremony, which was attended by more than 2000 people. The winners went through a competitive process and were selected from a pool of 1,609 teachers and 147 guidance counselors. Winning teachers and counselors received monetary awards of JD 3,000 for first place, JD 2,000 for second place, and JD 1,000 for third place. Also speaking at the ceremony was Minister of Education Dr. Mohammad Thneibat, who said that the time has never been riper for welcoming change, overcoming setbacks, and turning challenges into opportunities. Thneibat said that the ministry is working with the Association of QRAEE to capitalize on the strengths of previous awardees, and identify areas that need improvement in Jordan’s education system, in order to create a competitive culture of excellence in all of the ministry’s directorates. The event also featured opening remarks by the Director of QRAEE, Ms. Lubna Touqan, shorts films and a performance by Jordanian musician Hussein Al Salman. (VIDEO) Her Majesty Queen Rania of Jordan Attends the Women on the Front Lines Conference. On Wednesday, December 7, 2016, Her Majesty Queen Rania of Jordan attended the Women on the Front Lines conference in Amman, Jordan. “…women’s influential role in the media, and addressed the challenges they face while conducting interviews, especially when tackling a tough line of questioning with male interviewees. Participants in the conference included a number of prominent women from the fields of politics, media, and economics. Other prominent speakers included the United Nations Special Coordinator for Lebanon Sigrid Kaag, Egyptian International Cooperation Minister Sahar Nasr, CNN presenter Becky Anderson, President of the Jordanian Business and Professional Women Association Senator Haifa Najjar, and Iranian-American astronaut Anousheh Ansari. Women on The Front Lines is an annual conference organized by the May Chidiac Foundation bringing together some of the world’s most influential women, who have inspired leadership, change, and sustainability in their fields. The Foundation, which is a non-profit organization dedicated to training, research and education on media, democracy, and social welfare, was established in 2009 by Lebanese broadcast journalist Dr. May Chidiac, who survived an assassination attempt in Lebanon in 2005. (VIDEO) Her Majesty Queen Rania of Jordan Attends a Workshop in Al Balqa. “…on the deteriorating performance of Jordanian students in the Trends in International Mathematics and Science Study (TIMSS), during a visit to the Mahes Secondary School for Girls in Al Balqa. She also dropped by mathematics and science lessons taught by student-teachers enrolled in the Pre-service Professional Diploma Program implemented by the Queen Rania Teachers Academy (QRTA), who are currently fulfilling their practicum module at the same school. 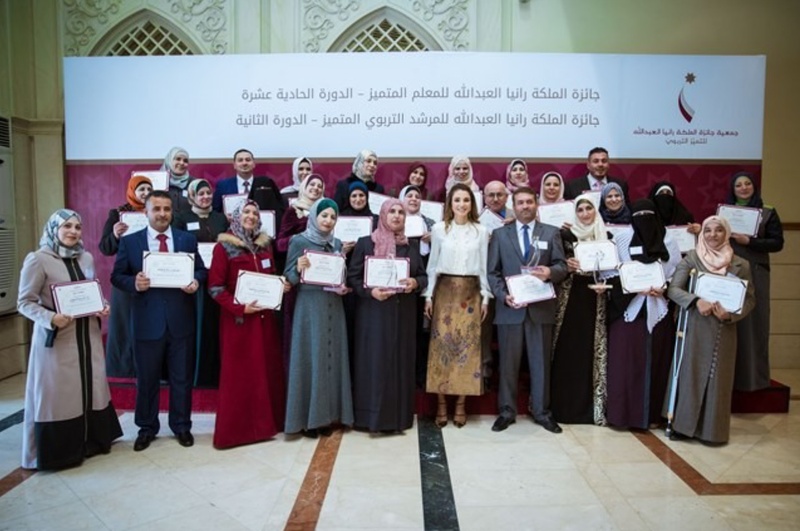 During the workshop, attended by 50 educators and moderated by QRTA’s Dr. Ahmad Qublan, Queen Rania said that the latest TIMMS assessment results are an indication that school curricula and teaching techniques are lacking, and warned that generations should not have to pay the price until a satisfying development of Jordan’s education system is achieved. Her Majesty said that change doesn’t happen overnight and urged teachers to propose ways to develop the education process in order help students apply what they learn to real life situations. The Queen said that the TIMSS results were shocking because they revealed that most students are neither fully grasping what they are taught nor are they capable of employing their knowledge, especially in mathematics, which should rely on understanding and reasoning, rather than memorization. She also explained that there are inexpensive and innovative ways to improve students’ performance through technology software that helps teachers better communicate information to students. The Queen also noted that efforts are underway to establish a teaching college in cooperation with Jordan University that would be able to train a much a larger number of teachers before they start their teaching careers. In response to comments by teachers who said that students do not take international exams seriously because they don’t factor into their school grades, Her Majesty said that ‘teachers and schools have to build the right environment that creates incentive in students to excel in any exam. Students should have the personal motivation to prove to themselves that they can do well in any exam, even if there is no direct return,’ Her Majesty added. The performance of Jordanian students in last year’s TIMSS assessment has dropped drastically, placing Jordan 23 points below its rank in eighth grade Science. This constituted the largest drop by any of the 39 participating countries. Jordan’s score in eighth grade mathematics was also low, ranking 8th among nine participating Arab countries. Teachers participating in the workshop expressed their frustration with the current science and mathematics curricula, on the grounds that they do not focus on the student’s understanding of the subjects and instead reinforce memorization rather than analysis. They also said they feel they lack effective teaching techniques that enrich students’ understanding based on reasoning, interpretation, and a logical thought process. Some attributed the low TIMSS scores to lack of knowledge on the part of both teachers and students about the importance of this international assessment. Several teachers told Her Majesty that they would like to see schools institute more extra-curricular activities that help students with problem-solving. Many, who have received training from QRTA, also called for establishing more education networks that can enhance their teaching techniques. School Principal Mrs. Razan Zou’bi and Director of the QRTA Pre-service Professional Diploma Program Mrs. Suhair Alkhatib accompanied Her Majesty while she attended part of the classes taught by student-teachers enrolled in the diploma program. QRTA’s diploma, a first in the kingdom, was launched in October 2016 under Queen Rania’s patronage, with the aim of preparing future educators to transform their classrooms into environments that encourage innovation, leadership, and intellectual curiosity. The program’s first cohort of educators includes 185 teachers, who went through a highly competitive selection process. The practicum segment, or ‘School Experience’ module, aims to improve the teachers’ professional standards and facilitate their entry into the profession. QRTA aims to graduate between 5000 and 7000 students in the upcoming five years. Upon completion of the nine-month 24 credit hour diploma, student teachers will commit to a teaching job with the Ministry of Education for four years, and receive a monthly salary during the training period in accordance to its regulations. (VIDEOS) Her Majesty Queen Rania of Jordan Receives a Humanitarian Award. On the evening of Tuesday, November 29, 2016, Her Majesty Queen Rania of Jordan received the Foreign Press Association’s Humanitarian Award in London, England. Her Majesty was given the award in recognition of her “…extraordinary humanitarian work addressing the Syrian refugee crisis, and her active and compassionate role in promoting education and championing women…” according to the official website for the queen. 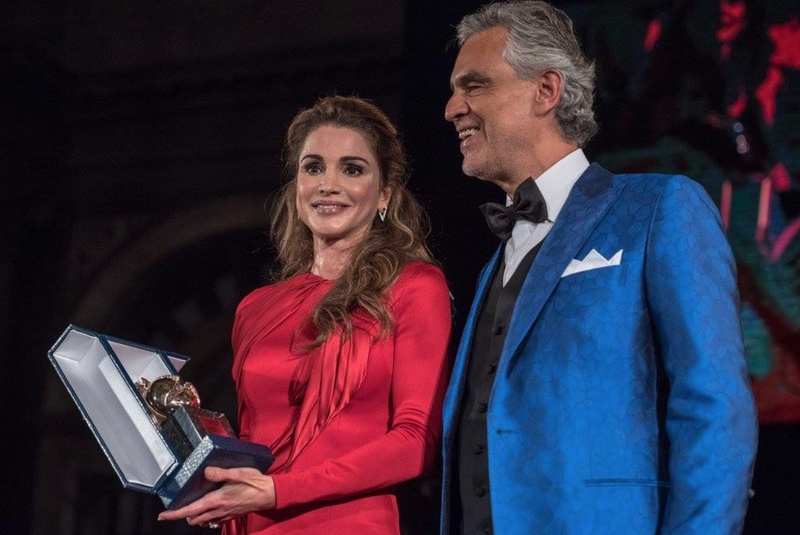 Her Majesty Queen Rania of Jordan Receives the Humanitarian Award from the Andrea Bocelli Foundation. 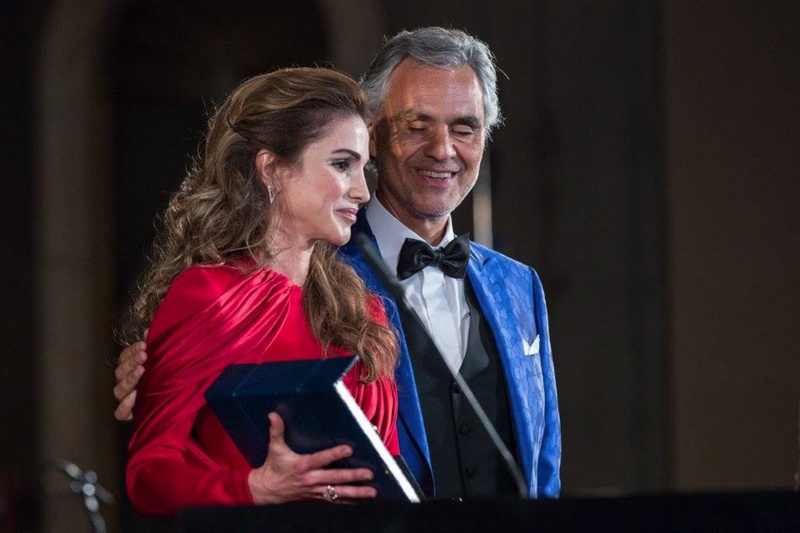 On Sunday, September 11, 2016, Her Majesty Queen Rania of Jordan was in Florence, Italy, where she received the Humanitarian Award from the Andrea Bocelli Foundation in recognition of her advocacy for refugees, children’s rights, and community empowerment. ‘They want us to live in a world of black and white, where the only color is the red of bloodshed,’ the Queen explained. In a clear reference to Daesh, the Queen said their priority is to destroy the heritage, art, and any sign of civilization in the region. Queen Rania mentioned the historic city of Palmyra in Syria and Iraq’s Nimrud as examples of these transgressions. ‘They have declared war on all civilization, but perhaps their most painful attack is that on the innocence of childhood. Like Omran Daqneesh,’ the Queen added. Queen Rania stressed on the need to respond to this crisis by fighting the extremists and supporting refugees, who have had to bear the brunt of the conflict. She also pressed the audience to question whether ‘civilizations in ruin, and childhoods buried forever under the rubble of war and indifference”’should represent civilization’s legacy for future generations. The Queen made these remarks at the Andrea Bocelli Foundation’s 3rd Italian edition of ‘Celebrity Fight Night,’ an event organized to raise funds for charities and recognize public figures for their humanitarian work. (VIDEOS) HM Queen Rania of Jordan Gives a Speech in Amman. On Monday, September 5, 2016, Her Majesty Queen Rania of Jordan gave a speech during the launch of the National Strategy for Human Resource Development (NSHRD) conference held at the King Hussein Business Park in Amman, Jordan. Sitting in the audience including various Jordanian government officials, members of the Jordanian royal family including His Majesty King Abdullah II of Jordan. We are here today to discuss education; an often fiercely debated issue, except when it comes to its importance, which is never disputed… Because education touches every Jordanian household; each of us has a son or a daughter, a grandson or a granddaughter, a dear child or a relative, who goes to school every day. We meet for their sake, not for the sake apportioning blame. The challenges our education system faces are numerous and complex; no one side is solely responsible for the problem, yet all of us have a responsibility to solve it. The most important lesson you taught us is that the shortest way to resolve problems is to confront, not ignore, them. You taught us to see things as they are, because downplaying challenges will come at the expense of Jordan’s future generations, and that is something you would never accept. You constantly challenge us to raise our heads high so we don’t lose sight of the opportunities that are often hidden among challenges. I realize that our current reality is difficult, and our surroundings more so. Still, I have great hope and great faith that we can turn the course of our history… Not through revolutions, aid, or the discovery of natural resources or even a buried treasure many dream of. The real treasure is all around us: there is no need to dig or search; it is in the minds of our children, and all we have to do is extract it. Fortunately, today, talent is the most valuable commodity in the world. Knowledge, innovation, and technology are key ingredients to the success of any country, and we are no exception. Success is within our reach if we invest in education today, not tomorrow –because the only thing that stands between our present, and the future we aspire to, is ourselves. Let us take the first step on the shortest path and examine our educational system with a critical eye. One hundred and fifty thousand children are enrolled in the first grade every year. What do we offer them? What does their journey within our education system look like? Ninety percent of the development of the human brain occurs before the age of five, and yet in Jordan, only a small percentage of students have access to early childhood education: just two percent under the age of three, and roughly twenty-eight percent between the ages of three and five. One the other hand, the enrollment rates of their peers in the Organization for Economic Cooperation and Development (OECD) countries are multiples times higher. After the child trusts his parents’ reasoning, and the parents trust that their child, their most precious asset – and ours- will receive an education that fulfills their ambitions, the child carries his schoolbag, pens and notebooks and begins the primary school journey. Gradually, lofty ambitions begin to fade in the face of the quality of education. Studies show that eighty percent of the second and third grade primary students underperform in reading… and that elementary school students in Jordan are falling behind in mathematics. We get to the eighth grade, and we see that instead of improving, Jordan’s ranking has deteriorated in the last two cycles in the TIMSS International Mathematics and Science Assessment. Then, in the tenth grade, we find Jordan ranking among the bottom ten countries in the Programme for International Student Assessment (PISA) on a list of fifty-six states. As for the General Secondary Certificate (Tawjihi), despite efforts to improve it and elevate its status, the outcome remains unsatisfactory. Last year one hundred thousand students entered twelfth grade. Only sixty thousand of them sat for the secondary certificate exam, of whom only forty percent passed. This means that for every four students in the twelfth grade, less than one will graduate! And this year’s results reflected a similar pattern. A student spent twelve years in our schools and did not learn how to read and write! Education reform is not easy, and it demands an unprecedented effort, in order to achieve unprecedented results. We must rethink structural issues such as education management, and introduce policies that bring highly qualified teachers into the teaching profession, and maintain their level of competence. Of equal importance are issues such as accountability and taking responsibility for poor educational outcomes. Yes, the figures are shocking but, unfortunately, they make sense. What can we expect if less than ten percent of the Ministry of Education’s budget is allocated to the development of the educational process, compared to forty percent in a country like Finland? What can we expect if fifty percent of our teachers chose this profession simply because it was the best or only available option to them? What can we expect if only one-third of teachers in Jordan have specialized in education? The rest are leading classrooms today with degrees in science, mathematics or Arabic, but without any significant training in teaching methodologies. We always say that teachers are the focal point of the educational process, but we have yet to make teachers the focal point of our attention. We place a burden of heavy responsibilities on them, without giving enough support to carry it. Despite that, we find them making every effort in the classroom for the sake of their students. How can we expect our children to excel in today’s world if we don’t equip them with new technologies and access to the Internet from an early age? There are hundreds of schools in Jordan that aren’t connected to the Internet. Those that are, suffer weak connections and slow speed. That is why we are optimistic about efforts underway to complete the fiber optic network in the Kingdom, and insist on the importance of connecting all our schools. We also cannot ignore the importance of what we teach our children. So, we must add our voices to the journalists and others who broke a taboo and spoke out on the need to reform a curriculum that has failed to produce graduates who have what it takes to succeed in the 21st century. The goal of this presentation is not to push us into a dark hole without hope or light, or to describe an irreversible reality. Change is difficult, but it’s not impossible. We have in our hands today a ten-year roadmap, which identifies the shortest and most effective paths to education reform. And here we are, moving forward. Our sincere gratitude to the National Committee for Human Resources Development for all their efforts. Jordan is not referred to as “the land of resolve” by chance. Rather, Jordanians have, over and again, shown that if they want to achieve something, they can. And we want quality education for our children; so let us start where we aspire to reach. We want our children to work and compete in the 21st century; so let us equip our schools with technology and e-learning tools so that our students become fluent in the language of the century. We want curricula that enrich learning and expand horizons of knowledge, so let us establish a curriculum center to implement the latest educational methods and curriculum development techniques – a model adopted by many top performing countries. We want qualified teachers. That is why we are cooperating with the Ministry of Education, the University of Jordan and the Teachers’ Academy to establish a teacher education college to train teachers for one year before they enter the classroom. Only then can they lead their classrooms with confidence, equipped with the necessary knowledge and skills to teach Jordan’s young generations. We will work with one of the best teacher training colleges in the world because we want the best education for our children, and the best training for our teachers. There is no shame in drawing on international expertise, or in attracting talent wherever it may be to expand our knowledge. In our fast-changing world, there is no time to reinvent the wheel. Let us learn from those who have succeeded, and let us import the right expertise and capitalize on it. Let us use those foundations to build strong Jordanian institutions that are able to nurture generations with a global outlook and a strong Jordanian identity. When we want, we can. That is why the most critical change we need is to break the mental molds and age-old limitations that have made our education system stagnant, rigid and incapable of keeping pace with changing times and growing ambitions. The toughest obstacles can only be overcome when we free ourselves from the high walls we have built within us, obscuring our vision and dreams. The education we provide our children over the course of twelve years must be a journey that is worthy of their childhood, their time and their trust… A journey that begins with planting the seeds of life-long learning, so that they can grow with open and inquisitive minds. Who here does not want that? Education reform must be a national priority and a popular demand today, tomorrow and ten years from now. In turn, our investments must mirror our priorities. Government spending on education must reflect the aspirations of Jordanians for quality education, so that we can take quick and confident strides towards the future we want, without fear or hesitation. I have previously called for an education revolution, but Jordan cannot stand strong unless we all move together. Ours is a country of strong institutions, and all of you here are decision-makers. Historical changes like the ones we’re are facing today require consensus and urgent unified action. I hope that commitment to change today, does not morph into blame shifting tomorrow. Let me reiterate that we are not here today to throw blame, because that is a waste of time. Let us fast forward ten years to the first week of school in 2026. We will find our children and grandchildren excited about going to schools that can realize their ambitions and ours. We will see them greeted by teachers who are eager to provide them with knowledge, which they have worked hard to acquire and develop. We will find their lessons alive with inquiry and self-expression. As for their curricula then, who knows what it will look like because with the constantly evolving education system we will develop, we won’t be able to predict today what our curricula will be a decade from now! We will find Jordan ranking amongst the top ten countries in international assessments, and the day of Tawjihi results will be a day of national pride. It will be a day when one hundred and fifty thousand young men and women graduate feeling confident of their ability to find jobs they excel in and provide for their families. What separates our reality now from that day, is consensus on education as a national priority, unwavering Jordanian resolve, and a commitment to a national strategy that can guide us out of this tunnel. Within the walls of this room and outside it, we have enough sense of responsibility, talent, and faith in education, to lead change and drive it forward. Let us commit and forge ahead towards an education system that meets ambitions of Jordan and its people. May God bless you and may you, through your resolve, be an asset to the nation. (VIDEOS) Her Majesty Queen Mathilde of Belgium Holds a Meeting with Her Majesty Queen Rania of Jordan in Brussels. On the afternoon of Tuesday, January 12, 2016, Her Majesty Queen Mathilde of Belgium met with Her Majesty Queen Rania of Jordan at the Palais Royal in Brussels. The purpose of the Her Majesty Queen Rania’s visit was to discuss the Syrian crisis as well as mobilizing international support for Jordan’s education system. “…showcasing the struggles Jordanian citizens face in cities that are densely populated by Syrians. She highlighted the impact the crisis has had on Jordan’s resources, infrastructure, and especially schools, which have enrolled 150,000 Syrian students. This has affected the quality of education at schools that have been forced to run double shifts, with teachers under pressure to handle larger numbers of students in each class. Click here to watch a video news report. Click here to watch a video news report of Her Majesty Queen Rania’s meeting with the Prime Minister of Belgium, Mr. Charles Michel, and the President of the European Commission, Mr. Jean-Claude Junker. 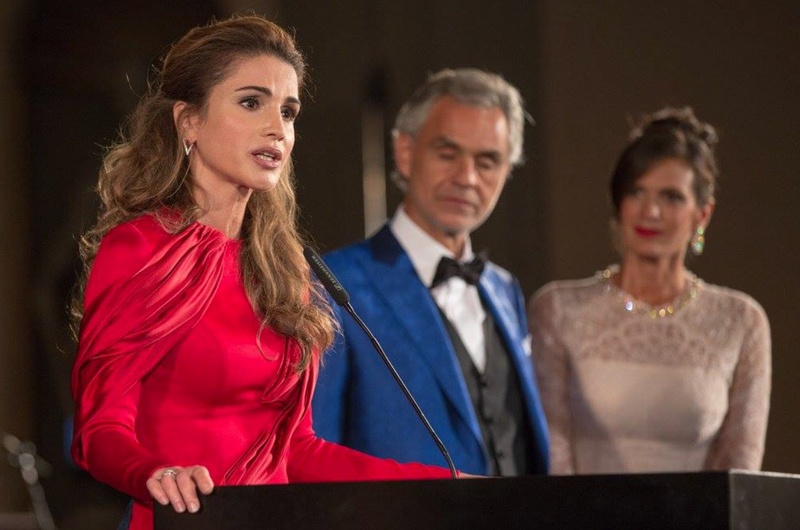 (VIDEOS) HM Queen Rania of Jordan Attends an Award Ceremony in Amman. On Monday, December 14, 2015, Her Majesty Queen Rania of Jordan attended the 10th Teacher Award and the 4th Principal Award ceremony held at the Royal Cultural Center-Al Hussein Youth City in Amman, Jordan. The ceremony was organized by the Association of Queen Rania Al Abdullah Award for Excellence in Education. During this afternoon’s ceremony Her Majesty “…honored 25 winners, bestowing prizes and plaques to 15 teachers who won in five different categories, as well as 10 principals who won the distinguished principal awards in two categories…” according to Her Majesty ‘s press office. “…the importance of recognizing teachers’ roles in building a more resilient and tolerant future generation. ‘Ten years ago, I launched the Teachers’ Award to start a tradition of recognizing outstanding educators whose skills reflect deeply on our success as a nation…’ Her Majesty said. ‘Respecting teachers is a public social responsibility that is rooted first within homes, and then in classrooms, where capable teachers can earn students’ respect with their knowledge and experience…’ Queen Rania said. ‘Students must realize the importance of education before going to school; they must realize that that between their present and a promising future lies a school, an education, and a teacher…’ she added. ‘Our young generation is being exposed to harmful new ideologies that neither our generation, nor previous ones, was familiar with —until today…’ she asserted. ‘We should teach them that they are part of a global community, one with more similarities than differences. Let’s teach children values that help them thrive, not ones that isolate and instill fear of the other…’ Her Majesty added. HM Queen Rania of Joran Meets with the First Lady of Gabon. On Sunday, December 12, 2015, Her Majesty Queen Rania of Jordan held an audience with the First Lady of Gabon, Ms. Sylvia Bongo Ondimba. (VIDEO) Her Majesty Queen Rania of Jordan Receives an Honorary Doctorate. On Thursday, December 10, 2015, Her Majesty Queen Rania of Jordan received an Honorary Doctorate from Sapienza Università di Roma in Rome, Italy. Her Majesty was bestowed with the degree of Science Development and International Cooperation in “…recognition of her activities in promoting peace and cross-cultural dialogue and her efforts against religious and gender discriminations…” according to a press release via the official website for Her Majesty Queen Rania. (VIDEO) His Majesty King Abdullah II of Jordan Gives a Speech During the MED 2015: Mediterranean Dialogues Conference. On Thursday, December 10, 2015, Their Majesties King Abdullah II and Queen Rania of Jordan attended the MED 2015: Mediterranean Dialogues Conference in Rome, Italy. Thank you all. It is an honour to help open the premiere conference of the Rome Mediterranean Dialogues. I know I speak for everyone here in thanking our Italian hosts for bringing us together at a critical moment. This gathering carries forward a living dialogue. For centuries, the people of the Middle East, Europe and North Africa have engaged with each other through trade, cooperation and learning. We communicate through the arts and culture of a common past; through ancient heritage sites and vibrant modern cities on both sides of the Mediterranean. We speak many languages, but shared values give us a common voice: for tolerance, for peace, and for mutual respect. In our generation, this living dialogue has come under assault. The terrorists, who struck Paris in November, or those who bombed Amman ten years ago, or those who are operating worldwide today, seek more than violent destruction. They seek to silence the voices of tolerance and cooperation and divide us from each other. The fact is, we will rise or fall together. Our regions are connected in virtually every way. When individual economies or political systems fail, when refugees flee, when violent groups find havens; when climate change dries wells and farmland, when millions of young people cannot find jobs, the impact cannot simply be contained and ignored. What once seemed national challenges are today global challenges. Yet it is this inter-dependence that also gives us power to respond. Within our broad Mediterranean region, partnership unleashes tremendous capabilities to shape the future we need: by economic, diplomatic and security action and above all, by protecting the core values that will sustain our future. No where is the need for partnership clearer than in the regional refugee crisis we face today. In recent years, Italy and other European countries have experienced an inflow of desperate people. Jordanians understand the fortitude and humanity that is being demanded of you — because our own country has been coping with an even larger refugee burden, for even longer. Jordan currently hosts 1.4 million Syrian refugees, one for every five Jordanians. One-quarter of our national budget is being consumed by refugee-related costs. For Jordanians, compassionate action is a moral duty. But the reality is that we and a few other regional host countries are carrying this refugee burden on behalf of the entire international community. The answer cannot simply be emergency aid — as vital as that is. There must be comprehensive, global engagement, to address a crisis that realistically, will not end soon. In economic terms, this means sustainable development support, especially in creating jobs and income. By partnering with us, enhancing trade arrangements and supporting our development infrastructure, Europe can help build a stronger Mediterranean neighbourhood. This creates opportunity in both regions. Jordan has worked actively with the global community for a comprehensive approach to the challenges that terrorist groups pose today. I have said from the outset that we are fighting a war within Islam against the outlaws of Islam, the Khawarej. Yet, as is painfully seen, these terrorists and outlaws threaten the entire world. They spare no peoples; they respect no boundaries, moral or geographic. The Middle East, Africa, Asia, Europe, the Americas have all been targets. This is a war we have to fight, and win, as a united global community. Our efforts must be framed within a broader strategy of military, diplomatic and human-development policies. In Syria, a political process is the only way forward to a credible, inclusive, non-sectarian future, one that will preserve Syria’s unity and independence. I am hopeful that we can now grab the opportunity that has emerged in the Vienna talks to move this process forward. Everywhere, we must stand behind the principles that unite our world. Today is International Human Rights Day, but until the Palestinian people achieve their rights, millions of people around the world will be cynical about the reality of global justice. Terror propaganda and recruitment thrive on this conflict, and we all pay the price. Mutual respect is the rockbed of partnership. We need to understand how critically linked we are. Muslims in Europe are part of the fabric of history and society, just as Arab Christians are part of the fabric of the Middle East. Europe’s Muslim-majority countries in the Balkans are part of its regional future, just as our regions are part of a shared global future. No hatred, no persecution of minorities can ever be justified or tolerated. This is the message we must give the next generation. Islam commands mercy and compassion, and upholds the equal dignity of every person. The Prophet Mohammad, peace and blessings be upon him, said: “None of you has faith until you love for your neighbour what you love for yourself.” This Golden Rule is found in Christianity, Judaism, and other religions. This is the message we must give the next generation. At the heart of our partnership are the values of cooperation and mutual aid. Our regions will only move forward by moving forward together. This is a pragmatic reality, but it is more. It reflects the moral strength that will sustain us. This is the message we must give the next generation, not only through what we teach but what we do. Here, at the Rome-Med Dialogues, your voices will help send these messages and more. To preserve and advance the shared moral values on which tolerant, inclusive, stable societies are built. I wish all of you the greatest success. (VIDEOS) TMs King Abdullah II and Queen Rania of Jordan Welcome the President of Germany to Amman. On Monday, December 7, 2015, Their Majesties King Abdullah II and Queen Rania of Jordan welcomed the President of Germany, Mr. Joachim Gauck, and his partner, Ms. Daniela Schadt, to Al-Husseiniya Palace in Amman, Jordan. The purpose of President Gauck and his delegation’s two-day official visit is to pay tribute to Jordanian society’s achievement in finding shelter for hundreds of thousands of refugees; furthermore, to continue to strengthen economic and bilateral ties between Jordan and Germany. 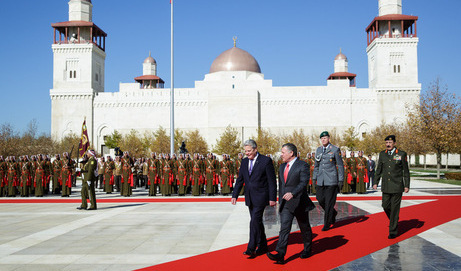 After the official welcoming ceremony and the reviewing of the Jordanian military guards His Majesty King Abdullah II and President Gauck participated in a meeting inside the palace. Discussions focused on the Syrian crisis, education, vocational training and water, as Germany is one of the countries that provide technical assistance to Jordan in the field of water resources management and conservation. In the evening, Their Majesties hosted a gala dinner in honor of President Gauck and Ms. Schadt’s visit to Jordan.